Welcome to the all new Ikos Oceania. Following major refurbishment of all public spaces in 2016, guests will experience a totally new level of luxury with fully renovated rooms and suites, as of 2017. 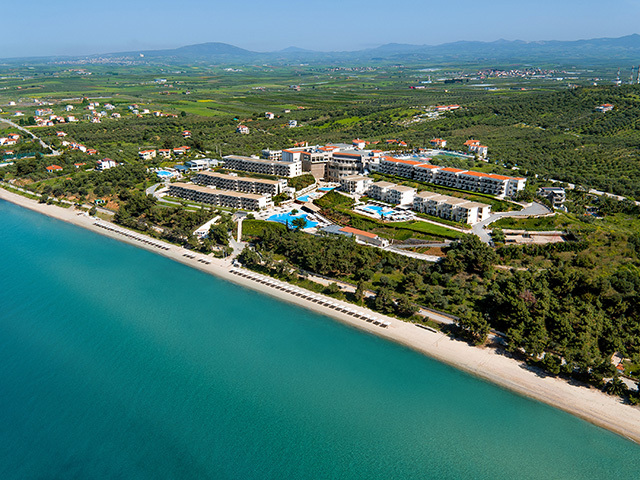 Ikos Oceania is an easy drive from Thessaloniki International Airport. The drive is 50 km and should take approximately 40 min. The stylish double room comes with a private furnished terrace and an extended bathroom featuring a bathtub or shower. Spacious and airy with floor to ceiling windows the room can accommodate two adults. Fully renovated in 2017. The stylish Superior Double offers a private furnished balcony with side or direct sea view. It comes with floor to ceiling windows and an extended bathroom featuring a bathtub or shower. Fully renovated in 2017. Spaciously elegant suite featuring a combined bedroom and living area for two adults and one child. The extended bathroom comes with bathtub or shower, while the furnished balcony or terrace provides magnificent sea views. Fully renovated in 2017. This privileged junior suite offers a combined bedroom and living area, extended bathroom with bathtub or shower and furnished balcony with magnificent views over the Aegean Sea and Mount Olympus. Fully renovated in 2017. Elegant suite featuring a combined bedroom and living area for two adults and one child. The extended bathroom comes with bathtub or shower, while the private terrace provides magnificent sea views. Fully renovated in 2017. Contemporary suite offering stylish living area and separate bedroom for two adults and two children. The extended bathroom comes with bathtub and a tropical shower cabin while the furnished terrace with sunloungers offers magnificent sea views. Fully renovated in 2017. Spacious suite suitable for two adults and two children with a living area, a separate bedroom and bathroom with bathtub and tropical shower cabin. A furnished private garden with two sunloungers offers magnificent views. Fully renovated in 2017. Ideal for larger families, these rooms feature interconnecting rooms with furnished balcony providing magnificent sea views. Elegant and contemporary, these rooms offer two spacious bedrooms and two bathrooms with bathtub or shower. Fully renovated in 2017. Very spacious luxury suite combining bedroom and living room in one contemporary open plan area. The extended bathroom comes with bathtub and a tropical shower cabin. Furnished balcony or terrace with superior views over the Aegean. Fully renovated in 2017. Ultra spacious suite combining bedroom and living room in one open plan area. Bathroom comes with bathtub and a separate tropical shower cabin. The furnished terrace and garden provide superior sea views. Fully renovated in 2017. This luxury suite features a spacious living area and separate elegant bedroom. It is completed by an extended bathroom with bathtub and tropical shower cabin and a fully furnished balcony or terrace with stunning sea views. Fully renovated in 2017. This ultra spacious suite features an ample dining and living area, a master bedroom, a bathroom with bathtub and a separate children’s bedroom with its own shower room. 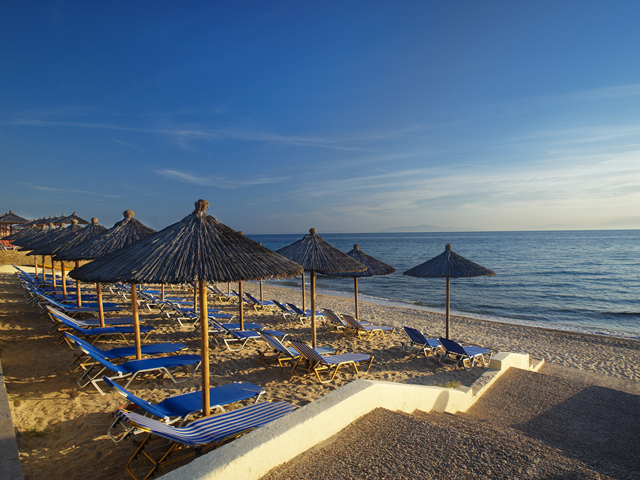 Offers stunning sea views over the Aegean. Fully renovated in 2017. This luxurious and spacious suite features an ample dining and living area, two bedrooms and two bathrooms. 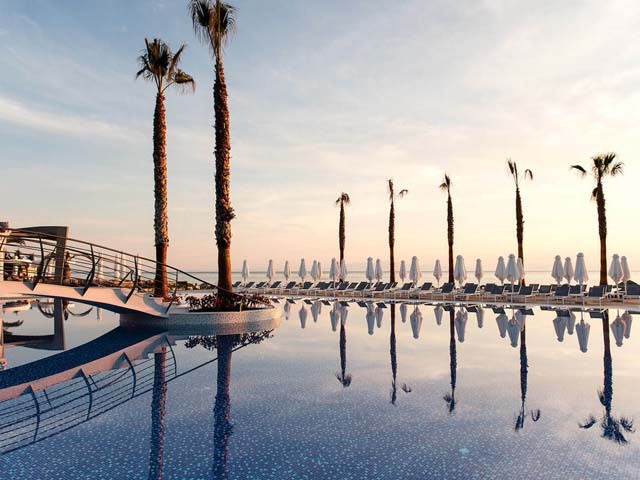 The furnished terrace and garden offers spectacular views over the Aegean. Fully renovated in 2017. Entertainment day and night by a multilingual animation team and Greek theme nights with live music. When it comes to food and drink the options are endless. Four à la carte restaurants, most with menus designed by Michelin-starred chefs with the Dine Out experience taking guests to some of the best local restaurants. The delightful open air setting is a serene way to start your day and an intimate environment in which to relax in the evening. The à la-carte menu treats guests to traditional Greek cuisine with a thoroughly modern twist and wines to please the most discerning palate. Please note that a reservation is required for this à-la-carte restaurant. All restaurants offer children menus and freshly prepared baby food upon request. A-la-carte menus are available for dinner only. Menus are subject to change. We would like to inform you that entry into the restaurants with shorts and flip flops is not permitted during dinner. At Fresco restaurant, the freshest ingredients are used with great skill to create the authentic taste of Italy. All complemented by a wine list created especially by our in-house sommelier. Simply reserve a table for a delightfully sophisticated evening in an intimate setting. Take a trip around some of the most desirable flavours in Asia with this imaginative menu from Anaya’s star chefs, serving up tastes of China, Thailand and India. Enjoy the à la carte menu indoors or al fresco on the balcony overlooking the ocean. 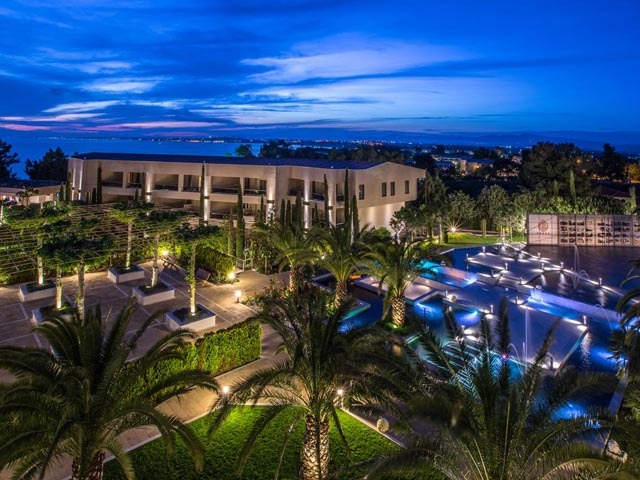 The elegant French á la carte restaurant in Ikos Oceania, turns a dinner into a real occasion. Enjoy all the delights of the Provencal menu in a unique atmosphere with a dedicated area for those guests in search of a quieter, more romantic setting. Offering stunning sea views, this elegant restaurant is the perfect destination for a memorable breakfast, lunch or dinner. The Mediterranean style buffet offers a delicious choice of dishes complemented by a carefully selected wine list. What’s more there is no need to reserve a table. Enjoy an evening of authentic Greek hospitality and fabulous food and wine with the innovative Dine Out experience. Ikos Oceania invites guests to discover the delights of some of the best local eateries at no extra cost.